ANT Wireless 9-Degrees of Freedom sensor. The Havant-Dof board (HNT-DOF-1) is a wireless 9-Degrees-of-Freedom sensor that uses the ANT wireless platform to transmit and receive data. It combines tri-axis accelerometer, gyroscope and digital compasses along with an ANT wireless module and a reprogrammable PIC processor. 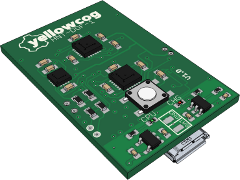 The module is also available with a secondary set of accelerometer and gyroscopes offset from the first to provide incredibly accurate and information rich data. By using an accelerometer, gyroscope and compass an object's movement and orientation changes can be tracked. The accelerometer provides three-axis movement (X,Y,Z) with the gyroscope providing data on rotation about the X, Y and Z axes (referred to as roll, pitch and yaw). To give an absolute indication of direction the digital compass provides a magnetic (convertible to a polar) heading. The MEMS gyroscope can sample at very high data rates (up to 8kHz) but for practical purposes can be filtered down to transmittable data rates (See technical specs).